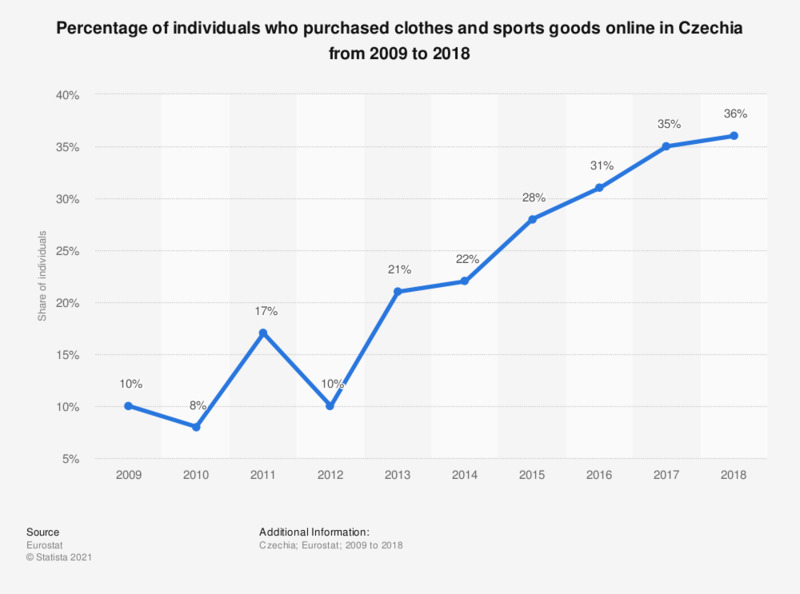 This charts illustrates the percentage of individuals who made online purchases of clothes and sports goods in Czechia between 2009 and 2018. After some fluctuation between 2009 and 2012, online shopping for clothes and sports goods in Czechia started to increase at a steady rate. In 2018, it reached a peak at 36 percent. Data given are based on the annual Eurostat Model Questionnaires on ICT (Information and Communication Technologies) in households and by individuals. The aim of the European ICT usage surveys is to collect and disseminate harmonised and comparable information on the use of Information and Communication Technologies in enterprises and e-commerce at European level. Data coverage corresponds to code I_BCLOT of INDIC_IS (Information Society Indicators).